Marlon Pacheco and Alexandra Arroyo de Pacheco. Alexandra and Marlon do everything with excellence as for the Lord. 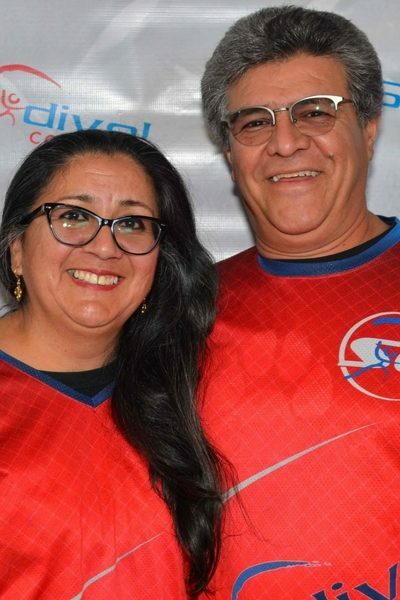 They are an enthusiastic team from Ecuador, South America, got married in November 1988, moved to and lived in Charlotte, NC since October 1999. They have 2 children. They love the Lord, family, travel, and volunteering.In 2015 they received the Governor’s Award for Volunteer Service of Mecklenburg and Union Counties. They came to volunteer for CarolinaFest for the first time in 2010. They started giving a hand around 2011. They are doing some of the landscape and part of the maintenance on the field and now officially part of the staff of Skydive Carolina. They love being part of this big family and enjoy the opportunity to see the beautiful sunsets for about 7 years. Marlon studied Horticulture at the University of Manabí in Ecuador. Alexandra studied at the Zamorano Pan-American Agricultural School known as Zamorano in Honduras. Marlon has done 2 tandems, Alexandra has done 5 tandems and they are looking forward to doing many more.